ALLSOPP William George Son of Alvin and Sophia of Hill House, Pauntley. 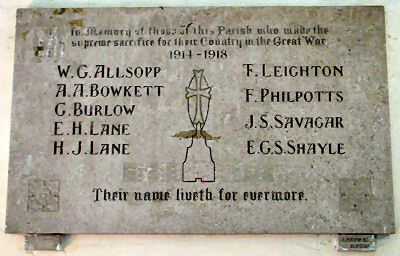 William George Allsopp was born in Berrow (Worcs.) to Alvin George Allsopp and Sophia Louisa nee Howells. He was baptised at Castlemorton St Gregory on January 12th 1890. His family moved to Pauntley sometime between 1897 and 1901. William enlisted in the navy August 12th 1910: service no.K8424. He was killed - age 27 - when HMS Defence was sunk at the Battle of Jutland on May 31st 1916. His rank at the time was Petty Officer Stoker. He is commemorated on panel 14 on the Plymouth Naval Memorial. William was apparently married to Eva Rebecca nee Robbins, who at the time the CWGC compiled its listing was living at Market Square Newent. LEIGHTON Frederick. Son of Frederick and Clara nee Leech of Pool Hill, Pauntley. SAVAGAR James Stephen M.M. Cpl 30513, 4th Worcestershire Regt, died 29/9/1918 age 21. Son of Edwin and Amy Selina, nee Brack of Prinknash Gardens, Painswick, Glos. Buried at Hooge Crater Cemetery, Belgium, XVII.D.14.